After watching a recent episode of Good Eats called Dill-icious which describes how to make kosher dill pickles at home, I decided to try my hand at it. 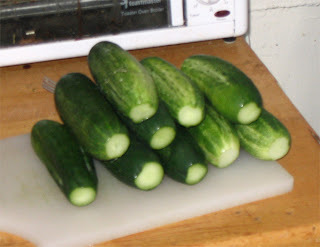 f it leaks) which I placed on top of the cucumbers to keep them submerged. I used a rubber band to secure a paper towel over the top of the container just to stop bugs and dust from getting in. 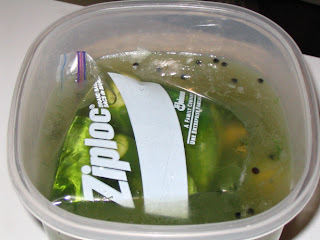 Even though it looks like there are cucumbers/pickles in that ziplock, I assure you that it is an optical illusion (the water filled bag is acting as a lens). This is a very similar procedure which will cause a very similar fermentation to sauerkraut. The only difference is that you add the salt already dissolved in water instead of counting on it to draw enough water out of the food to form its own brine. Essentially at this level the salt will inhibit "noxious" microbes, while allowing "tasty" lactic acid bacteria to ferment. Another, simpler way to make pickles is to add acetic acid in the form of vinegar to the brine, and let the pickles soak for a few days. This way can produces good pickles, but they will have a harsher acid character that I do not enjoy as much as fermented pickles. Theoretically you could add food grade lactic acid to the solution as a short cut, but I'll leave that for someone else. 11/03/07 Tasted one of the pickles after about a week, not much sourness and the saltiness is a bit strong and there is still a bit too much "cucumber" flavor. 11/08/07 Moved into fridge a few days after a Pediococcus (?) pellicle formed (last picture). 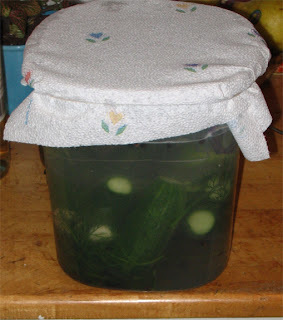 This will shut down fermentation and still let any CO2 out, nobody wants carbonated pickles. 11/12/07 Put the pickles into mason jars and then topped up with the strained pickle juice. 11/16/07 Pickles taste pretty good, and looks just like a commercial pickle. Full tasting soon. Thanks for this, I'm going to have to give it a try. Same here, I'm going to give it a shot. have you ever considered making Kimchi? Yeah, like Brian said.. you have to give Kimchi a try. I've tried it and the result were great. 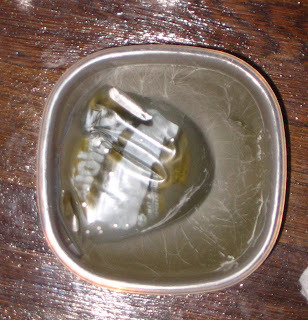 Can you hot water process the canned pickles, or do you have to keep them refrigerated? I assume without adding vinegar to the recipe you have to ensure they are kept cold to prevent spoilage, if you can't process them via hot water processed canning. How long will they keep that way in the fridge? You certainly can heat process this sort of pickle ( http://pickyourown.org/pickles_oldfashionedbarrel.htm ). Mine were fine for about a month, they might have gone longer (Good Eats says 2 months in the fridge) but that’s how long it took for me to eat them.